About a year ago [19 February 2016], I went in search of the site of Bray Castle in the north Wicklow town of Bray. At the time, I wondered whether the castle had given its name to Castle Street, but the castellated row of shops in Castle Street hardly looks like the site of a mediaeval castle. Yet it is obvious that a castle must have stood near that site, with its memory is perpetuated in the names of the Castle Garage and Castle Furniture. Despite early Roman finds in the 19th century, there is no definitive evidence that there was a village in Bray until the arrival of the Anglo-Normans. The first Anglo-Norman settlement in Bray was led by Walter de Riddlesford, who in 1173 built a castle in Bray. The castle is no longer standing. But during a late morning stroll through Bray today [3 February 2017]. I came across the site of the castle built by Walter de Riddlesford, originally on a rocky promontory overlooking the River Dargle. Walter de Riddlesford was granted lands in this area by Richard de Clare, better known as ‘Strongbow,’ after the Battle of the Strand where he fought valiantly. The site of Bray Castle is at the rear of a house named ‘Clonmore’ on Herbert Road. An irregular curve in a boundary wall on a laneway at Church Terrace, behind Herbert Road, is all that remains of the site of the castle today. The laneway is a continuation of Church Terrace, to the west of the former Church of Ireland parish church, Saint Paul’s Church and its former churchyard. The original castle would have been a standard motte and bailey, consisting of a wooden rectangular keep, surrounded by a moat. It was rebuilt later as a stone castle, and a new village grew up around its walls, including a church and a mill. The first bridge crossing the River Dargle near this site was built in 1666 and the present bridge was built in 1856. The cottages on Church Terrace back onto Herbert Road, where their dormer windows and chimney stacks provide a quaint illustration of life in Victorian Bray. Church Terrace is uniform terrace of five three-bay, single-storey houses, built ca 2830. The façade of each house is rendered, and all of them are painted apart from the house to the far west end. The roofs are pitched and covered in either natural or artificial slate, whilst the properties share brick chimneystacks with corbelling. To the rear or south side of the roof of each house, there is a small gabled dormer with decorative bargeboards. The entrances are filled with panelled timber or uPVC doors and some of the entrances retain moulded dripstones. To the rear of each house on the terrace, there is a small yard enclosed from the side of Herbert Road by a tall rubble wall, some of which include doorways. This area, which is largely hidden from view, has a quaint and picturesque charm. The terrace, the neighbouring church, which was once Saint Paul’s Church of Ireland parish church, and the walls of the castle, and the remains of a former 17th-century barracks form an important part of the historic core of Bray. The military barracks was built in 1692. It was closed in 1818, and was used as a dispensary before being converted into apartments. From the rear of Church Terrace, two of us walked a little further west along Herbert Road as far as Colesburg House and Glencoe House. This is a pair of largely matching but not identical semi-detached, three-bay, two-storey over basement double-pile houses. They were first built ca 1900 and are now divided into apartments. These two houses are substantial Edwardian semi-detached houses, and despite being divided into apartments they have a quiet dignity that enhances the streetscape in this part of Bray. 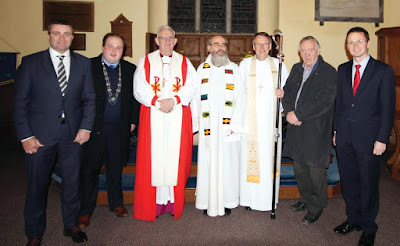 The parishioners of Rathkeale and Kilnaughtin, Diocese of Limerick, have heartily welcomed Canon Patrick Comerford as their new priest-in-charge at a service in Holy Trinity Church, Rathkeale. 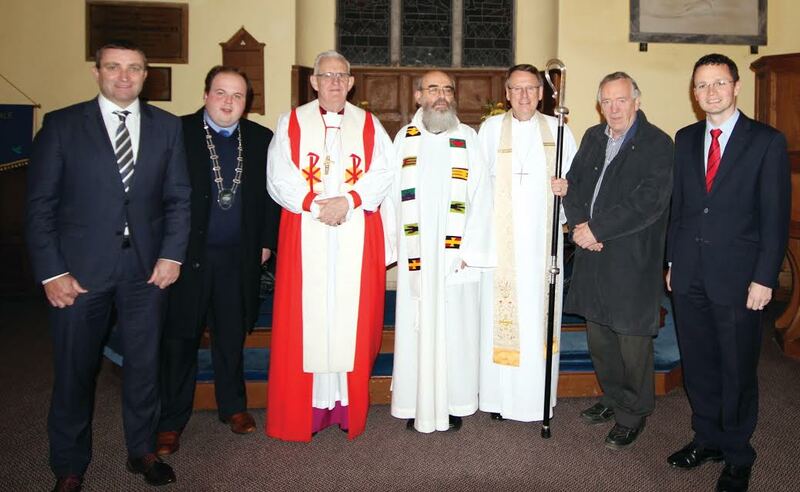 The service was conducted by Bishop Kenneth Kearon, and the preacher was the Rt Revd Dr John Neill, retired Archbishop of Dublin. The hymns for the occasion were specially chosen by the new priest-in-charge and the church was filled with joyful singing. Canon Comerford’s appointment to this part-time post is a great encouragement to a widely dispersed congregation, from Tarbert/Listowel to the borders of Adare parish. He will be combining his ministry in Rathkeale with the part-time role of Director of Education throughout the Diocese. We celebrated Candlemas or the Feast of the Presentation of Christ in the Temple yesterday [2 February 2017]. In the morning, it seemed to take a long time for the darkness to clear away to the eventual brightness of the dawn as I presided at the Candlemas Eucharist in the Chapel of the Church of Ireland Theological. Later in the evening, as darkness had closed in, I was welcomed back in Christ Church Cathedral, and took my former seat in the chapter stalls for the Candlemas Procession and Eucharist. As I took my place in the cathedral, I was aware that hundreds of people were gathering in Ballsbridge to protest outside the US Embassy to voice their disgust and fears at President Trump’s latest capricious actions against immigrants and refugees, targeting Muslims in particular and posing an immediate threat and danger to people fleeing Syria. Then I will draw near to you for judgement; I will be swift to bear witness against the sorcerers, against the adulterers, against those who swear falsely, against those who oppress the hired workers in their wages, the widow, and the orphan, against those who thrust aside the alien, and do not fear me, says the Lord of hosts (Malachi 3: 5). In the Gospel story (Luke 2: 22-40), Saint Joseph and the Virgin Mary bring the Christ Child to the Temple in Jerusalem, where the Prophet Simeon foresees how this child is going to be a light to the nations. They return to their home Nazareth, and I realised how from an early stage in his life, Christ was familiar with the dangers on the road to the Temple in Jerusalem, and yet he could see how people who were marginalised because of they belonged to a different expression of faith were not the principal threats or dangers during our journey in life, but the brigands we do not recognise in our own community. I wondered whether he might have story of the Parable of the Good Samaritan in another way today? But in saying ‘The one who showed her mercy,’ like the lawyer who could not say ‘The Samaritan,’ he could not find the inner strength to say ‘The Syrian,’ ‘The Muslim’ or ‘The refugee.’ Nor could he ask why the others had passed her by. Anyone from the White House Press Corps who asked about this parable, was told the President does not believe what Jesus says. It is fake news, and the President has alternative facts he believes in. Jesus is now being deported to the West Bank. As for the woman, I cannot repeat the vulgar, distasteful comments Trump had to make about her.